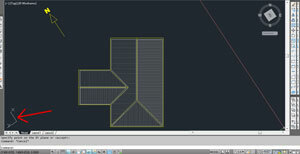 How to draw Shadow Diagrams in AutoCAD LT with Shadow Multi Cast LT software. 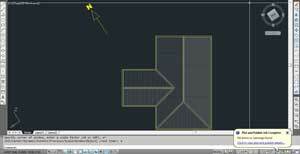 This tutorial will show you how to generate shadow lines using Shadow Multi Cast for AutoCAD FULL users. NOTE: North must always be facing up the screen to generate shadows correctly. The first steps show you how to do this. Type UCS at the AutoCAD command prompt. Then type Save and enter Old. We have just named the UCS rotation. This will be useful later on when you want to change between screen rotations. After saving the UCS, type UCS again to go back into the command. We now need to enter a point. 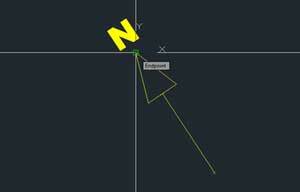 In the Tutorial drawing, pan up to the north arrow then Left Click on the bottom of the arrow. Now Left Click on the top of the arrow. The UCS icon (if turned on) will now rotate. Now type Plan at the command prompt and press Enter twice. The screen will now rotate as shown in the image. North still isn't facing upwards so lets fix that. 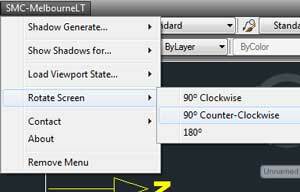 Goto the Shadow Multi Cast menu and scroll down to Rotate Screen and select 90 Counter-Clockwise. 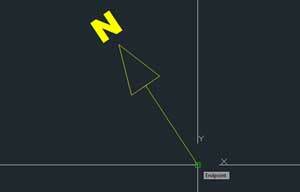 The North point should now be facing directly up the screen. You are now ready to generate Shadow lines. 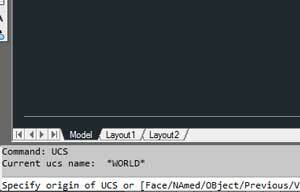 To save this UCS orientation, type UCS at the command prompt then type Save and enter NEW. If you want to rotate the screen back to it's original setting, type UCS, then enter R (for restore) then enter Old. The screen will now go back to the original setting. To go back to the rotated page, just type UCS again, then R then enter NEW. You can always rotate back and forth with ease using this method. 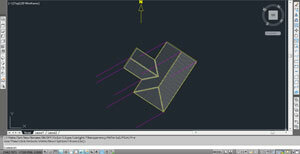 To start generating shadow lines, goto the Shadow Multi Cast menu and highlight over Shadow Generate. Another menu will appear asking which shadow lines you would like to generate. Select a time (e.g September 22nd) and another menu pops up asking which hours you would like to generate. Select all hours. You are now prompted to pick an insertion point on the building. Pick a point as shown in the diagram. Next you need to type in the wall/roof height at that point. Enter 3000 for 3000mm. Congratulations, you have just created your first shadow lines. Continue clicking points and entering heights all around the building. Use any heights you like for the tutorial. 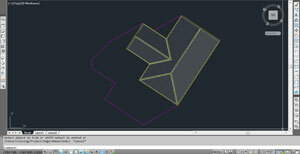 After generating all the shadow lines, the next step is to draw in the outline of the buildings shadow. It can be a little confusing with all the lines showing so turing off all the layers you don't need is useful. To do that easily, goto next step. Turn shadow layers on and off is easy using the menu. 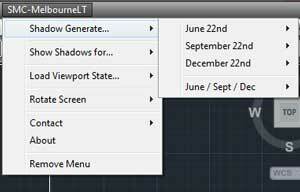 Goto the Shadow Multi Cast menu, highlight your mouse over Show Shadows for... then select the Month and hour you wish to isolate. 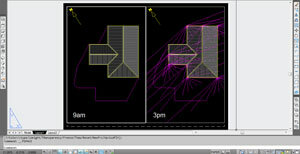 After selecting the hour, all other layers are turned off as shown in the diagram. Now it's time to start drawing in the shadows. Turn on OSNAP if not already by pressing F3, and make sure it is set to snap to Endpoints. 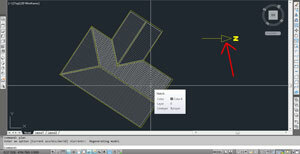 Now draw in the lines as shown in the diagram. Once you have drawn in the line, you can delete the redundant shadow lines and trim lines that go through the building. Repeat turning on and off layers to draw in all the other shadow outlines. The Load Viewport State in the Shadow Multi Cast menu is to assist in setting up shadow diagrams in paper space. Make sure you are in Paperspace, setup 2 viewport(s) if you haven't already. 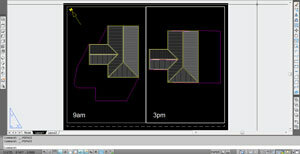 All the layers are now on in Model Space and can be seen in Paper Space as shown in diagram. All those shadow lines are messy, lets fix it up in the next step. 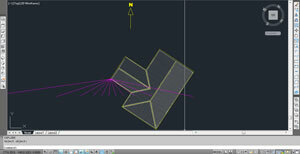 Double click in the left viewport. 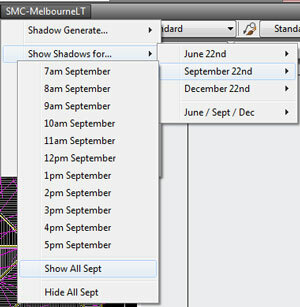 Once inside the viewport, goto Shadow Multi Cast menu, scroll down to Load Viewport State, then Select September 22nd, then Click on 9am. All the layers except for Sept9am are frozen in the viewport. All the layers are still on in Model Space but are frozen in Paper Space. 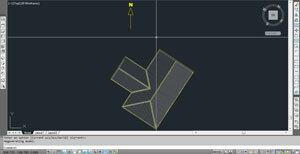 Double click in the Right Viewport. 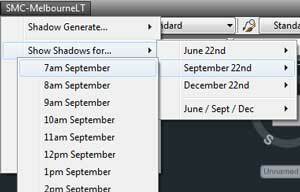 Again, goto the Shadow Multi Cast menu, highlight Load Viewport State, then Select September 22nd, then Click 3pm. Your drawing should now look like the image to the right.